Giveaway! Time for a New Bible! My husband, Brian, gave me this Bible for Mother’s Day, 1994, almost 20 years ago. I used this Bible for every lecture I prepared and delivered as a Teaching Leader with Bible Study Fellowship from1999 until the fall of 2013. I decided after my final lecture on September 23 to retire this Bible. It’s been through a few wars with me and is pretty much falling apart. I’ve glued the cover on with Elmer’s multiple times and had to glue whole sections into the binding with rubber cement. Some pages are taped where I accidentally tore them. They say that a person whose Bible is falling apart is a person who isn’t. Trust me; there have been plenty of times I thought I was falling apart! My Bible didn’t hold me together, but the words of God did! Each day as we open the Bible, read it, and ingest the words, God changes us. He strengthens, sharpens, smoothes rough edges, comforts, challenges, convicts, and matures us. God’s word sustains us. It’s interesting, rarely do we think of going a day without food, but we’ll go for days, weeks, month, even years at a time without feeding our souls. We can’t make God happier, or earn his favor by reading the Bible more, but we can understand who God is and who we are supposed to be by reading it more. Is God calling you to his word? God’s word also gives us direction and light in the darkness of an often frightening world. When the culture is continually pulling us and lying to us, how can we know which way to go? Psalm 119:105 “Your word is a lamp to my feet and a light for my path” Do you feel lost when it comes to reading the Bible? Do you need direction? Maybe I can help you find a starting line. A few years ago I discovered the “One Year Chronological Bible”. It is a wonderful way to read through the Bible. All of the Scriptures are there; nothing added, nothing taken away, all of God’s Word arranged chronologically. It is like reading the greatest novel of all time… God’s Story! Since some friends gave me a beautiful, new black leather, (large print!!) Bible this spring to replace my retired one; I thought I’d ‘pay it forward’ by giving away a “One Year Chronological Bible” this week! If you’d like an opportunity to own the Chronological Bible – just comment on the blog and you’ll be entered. You can simply say ‘I’m in’ – or better yet, share an encouraging word! I’ll pick and post the winner on December 2. Good luck! And God bless! Marcia, while reading your blog this morning I felt it was a message written for me. My hubby bought me a bible a few years back and I’ve had a hard time trying to read and understand it. I gave up and put it away. I always hoped (prayed) someone would write a “Bible for Dummies” so I can understand. To hear that there is a version that is easy to read made my day. One of my goals in life is to build my faith stronger and this would be a great step for me. Thanks for sharing this information. Sooo glad this encouraged you today! I just searched the internet to find a new Bible. 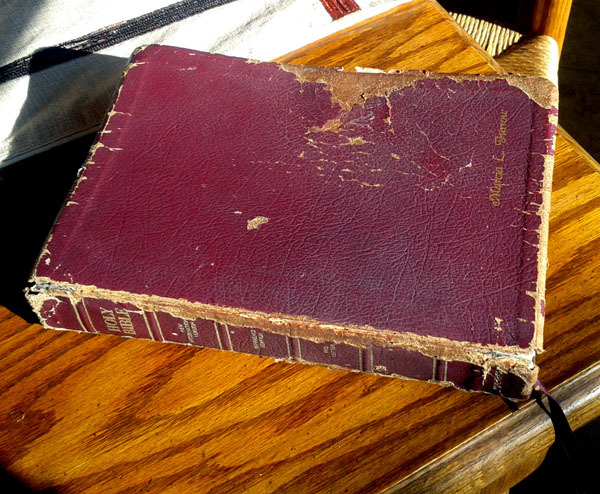 My 1st edition of the Women’s Devotional Bible that I started using in 1996 is falling apart. I love this particular Bible because if I don’t remember the address of a particular scripture, I can “see” it on the page. I know which side of the page and what column I’m looking. After the Bible arrived, I said to Melissa, “I wonder how many of these I need to find to carry me to the end?” Love you, Marcia! Marcia, love your posts. Have a Happy Thanksgiving! I see God working through you and I have grown in the Lord because of your ministry with BSF. I am excited about what the Lord has in store for you dear friend I don’t need a Bible, but if would win I would ” pass it on, because it only takes spark to keep a fire going.” You are in my prayers! Thanks Carolyn! And thanks for all your help! Tammi, there are many ways to ‘read through’ the Bible… but I am totally sold on the Chronological Bible! When I saw and read the condition of your Bible, I was reminded of the quote “When you see a Bible that is falling apart, it is always in the hands of someone who is not! !” God bless you and your family and Happy Thanksgiving!!!! Happy Thanksgiving to you, too, Janet! Loved this! I remember your bible from our times at BSF. I have never read the chronological bible! That would be really a great thing to do for the new year. The Holy Spirit will teach and lead us into all truth! there was 1 time I didn’t lecture from this Bible; I forgot it at home and had to borrow yours… do you remember? I do! How did that happen? That must have been so disconcerting. What wonderful memories we have of that special time. Hi Marcia, love your posts. I don’t need the Bible either, but I have someone in mind if I were to get one. Marcia, I love your blog! Thank you for all of the encouragement you give us! Happy Thanksgiving! Thanks, Angela! And, good luck! I have a bible from 1994 also; I don’t take it out anymore because it too is falling apart, I’ve tried duck tape; which works well; I hadn’t thought about cement glue – that’s a great idea! Pages get very fragile; but I have written in it where I’ve prayed for friends and family. So it still is precious! Love your posts…are you speaking anywhere? Thanks, Marianne, yes, there are some speaking engagements ‘in the works’ – as soon as we nail down places/dates/etc., we’ll post them on ‘future events’ on the website… I do have one coming up in March in Crown Point, IN that is listed there. my bible is well worn as well,stuffed with pieces of paper for scriptures that have touched me also with poems and card and such that people have given me over the years,oh yeah and that time i spilled my morning coffee on it! My Bible is from college. A friend thought I needed a Bible since I wasn’t saved. It’s from 1985….NIV….I use it everyday! Love it! what a sweet memory for you! Your Blogs always make my day. I know my faith is not as strong as it should it be and you help bring me back to reality!! Love you!! Oh, but Cathy, your faith is in the Living God… so it is a sufficient faith! I am praying for you. I have read your blog and am blessed by your ministry. It is a pleasure to have your blogs to bless and enhance my life. Thank you. Thank you, Sandy! What great testimony of the all-sufficiency of God!